Solenergy Systems Inc. has designed, installed and commissioned a 739.2kWp grid-tied PV system for Landmark Corporation, a major supermarket chain in the Philippines, at their newly unveiled Alabang site. Comprising 2,640 PV modules and 33 Fronius Symo -20 inverters, the system is expected to offset a major portion of the facility’s daytime electricity consumption, reducing both the operating costs and carbon footprint of the building. The project was awarded to Solenergy by GMCAC, an International consortium of GMR Group (developer and operator of airports worldwide) and Megawide Construction Corp. The system comprises 65 Fronius Symo 3-phase inverters, offering real-time online system monitoring and added safety functionality, such as arc and ground fault protection. The racking system was custom designed by Solenergy, with a cast in place ballast solution offering resistance to elevated wind speeds that are often experienced in the Visayas region. Solenergy also supplied a bespoke curtailment solution to enable the client to operate the PV system in parallel with their gensets, in case of brown out. In addition to such a notable solar power system, GMCAC also commissioned Solenergy to re-engineer the power room of Terminal 1. This included design, supply and installation of panelized switchgear and resin encased busduct system. The ability to offer advanced AC-side power solutions, further differentiated Solenergy from other suppliers. GMCAC demanded a full-service contractor for their ambitious new power plant and only Solenergy fit the bill. Bolstering a 75kWp solar grid-tied system at the top floor, 8 Rockwell in Makati City is one of the few urban high-rise projects in the Philippines to integrate photovoltaic (PV) panels to their roof space. The system is expected to yield 94,247kWh of power a year which is more than 1% of the building’s total annual energy requirements. Headed by Rockwell Land Corporation, the newly constructed office and leisure hub is actively pursuing green building recognition such as LEED certification with the help of renewable energy. 8 Rockwell’s system will be able to offset approximately 56,260 kg of CO2 emissions within a span of a year. Solenergy was commissioned to design and install a solar power system consisting of three 3-phase inverters with 480 polycrystalline panels to generate electricity for the elementary school building of GCC. The shift to solar power proved to be a drastically effective move towards reducing the cost of power consumption and establishing power independence to sustain the operations of the school in the future. Grace Christian College has ventured into a second phase of installment to expand the solar power system and increase its capacity. To reduce their dependency on utility-sourced power and also make a pioneering environmental statement, ISM commissioned Solenergy to install a rooftop solar power system at their Taguig campus. The system comprises 312 polycrystalline solar modules connected to 4 independent 3-phase inverters. It is connected to the medium voltage circuit at the site and will provide power to their entire high school building. ISM selected Solenergy to deliver the turn-key system ahead of several other proposals owing to the comprehensive nature of our system design proposal and feasibility study. As part of their energy savings and cost reduction campaign, the client approached Solenergy Systems Inc. to provide a turn-key solar power system for a warehouse rooftop at their Metro Manila manufacturing facility. The system comprises 390 polycrystalline solar modules connected to 5 independent 3-phase inverters. It is connected to the warehouse power circuit and is expected to deliver over 550kWhr per day during peak production. Solenergy Systems, Inc. was selected through a competitive proposal process due to our local solar power experience, industrial power systems background, and competitive system pricing. To meet the increasing energy demand of operation requirements, Solenergy was commissioned to design, install, and maintain the first rooftop solar power system of Pioneer Hybrid Seeds, completed under a 20-year Power Purchase Agreement. 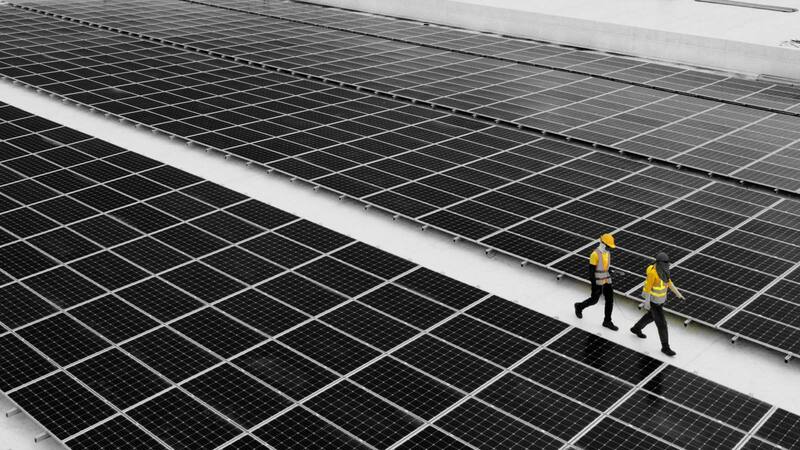 Thin-film modules connected to ten 3-phase inverters were installed at the production plant of the client in Tarlac City, which are expected to produce over 500kWh of energy every day. The project also includes a customized monitoring system to keep track of real-time system yield, developed by Solenergy. 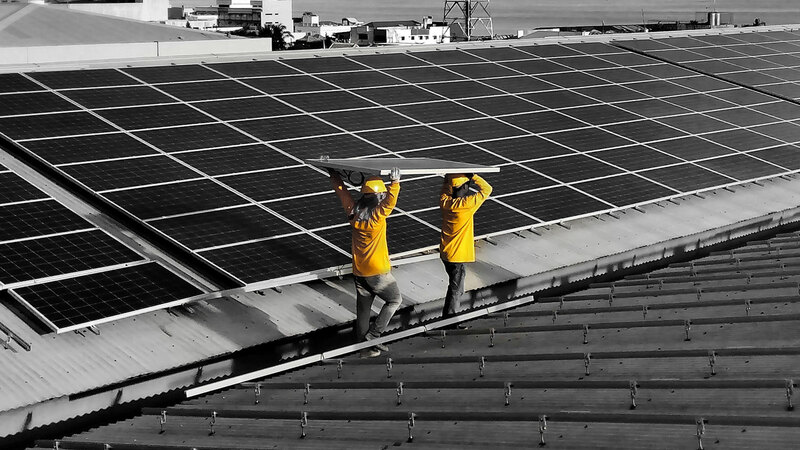 Solenergy encourages Filipino businesses to utilize their unused roof space by installing solar-powered systems on them. This will help companies cut electricity costs and fight global warming at the same time! Solenergy's turn-key solar rooftop solutions is suitable for businesses who are looking for an alternative source of energy that is as advantageous to the environment as it is on their pockets. Solenergy's energy solutions allows Filipinos minimize their carbon footprints through the use of clean, renewable energy. Using grid-supplied electricity can damage the environment significantly since burning fuel typically contributes to carbon and air pollution. With the help of Solenergy, companies and households in the country can offset their carbon dioxide, nitrous oxide, and sulfur oxide emissions to help save the environment and achieve carbon neutrality in the future. Solenergy aims to give Filipinos an alternative power source that is both affordable and dependable. We help small and big companies alike to avoid being dependent on electrical grids through viable energy solutions. Through Solenergy, different businesses can effectively cut their electrical costs without affecting the quality of their power supply. Solenergy uses Energy Management System (EMS) to productively manage and optimize different power platforms. EMS includes several solutions like demand control and load shifting which help clients save costs. Our use of this innovative system aids us in providing Filipinos with top-notch solar-powered systems that will effectively suit their needs. Solenergy's services does not end with providing clients with effective energy solutions. In the long run, we will also provide real-time site monitoring services to ensure that the installed solar-powered system is working effectively. Solenergy can provide clients with real-time information on the system's performance to make sure that they are getting the most out of their investment. Solenergy Systems Inc. was tapped to engineer and mobilize a fully-operational off-grid system for Salamangka. We were able to provide uninterrupted power and totally removing the threat of grid fluctuations that damage various resort amenities. Solenergy made a special order of 148 SolarWorld Black PV panels to aesthetically compliment the resorts design. Our strong network of tier-1 component partnerships ensure high quality and reliable support that’s crucial to any system demand and performance. As a step towards power stability and dependable sources of electricity, Solenergy designed and installed a UPS in Puerto Galera to set up a hybrid power supply for Lalaguna Villas. The initial 1-phase system was upgraded to 3-phase inverters to match the increasing demand brought by the growth and expansion of the resort. With this pioneering statement in the hotel and tourism industry, Lalaguna Villas managed to develop energy independence with decreased electricity costs and uninterrupted power that will further strengthen their hold on providing a unique experience for visitors of Puerto Galera. Going off the grid doesn’t have to mean having to endure unstable power. Solenergy’s use of only the best materials in their energy solutions ensures that it remains a dependable source of power all throughout its lifespan, from its installation onwards. Off grid systems are perfect for those in the distanced segments of the market who seek a reliable power solution that does not involve expensive network augmentation. Every project is treated as a special challenge – one Solenergy will always be willing to take! Our bespoke project approach means that we always tailor our developed solutions in accordance with each and every one of our client’s own set of unique assets. Our team of well-trained experts will ensure that all possible avenues are explored and utilized fully. Solenergy’s energy solutions support grid augmentation and stabilization, which allow for the regulation of power from both sources without having to completely rely on one or the other. Solenergy’s power solutions also support the seamless integration of PV modules into other structures, while also adding benefits such as temperature regulation, electricity production, and even weatherproofing features that are as good as non-generating material. Our solutions are not strictly one note. We are able to generate flexible, hybrid systems that can maintain its connection with the grid while also staying independent of it. Solenergy’s new home base will seamlessly integrate PV modules to its entire roof structure. The PV components will deliver mutually complementing benefits such as temperature regulation inside the office space and electricity production. Weatherproofing features from the mounting system will provide excellent durability and protection from the elements. Solenergy is capable of conceptualizing and designing Building Integrated Photovoltaics (BIPV). This ensures that our solar-powered systems are built using excellent materials to ensure effectiveness. We have a team of skilled professionals who design and construct superior BIPV solar installations that suit our clients' needs. Solenergy is a EPC company which means that we take care of the engineering, procurement, and construction, as well as the commissioning of the solar-powered systems. We fabricate structures wherein solar panels will be mounted for our clients' use. These constructions are built from high quality materials to protect it from corrosion and ensure a long life span. Due to our bespoke approach to every project, we are able to design power solutions that can adapt to existing architecture while also providing benefits for the structure that is at par with other, similar material. Solenergy ensures that every installation is aesthetically pleasing and will be able to conform to client needs. Solenergy can convert outer Facades into fully integrated solar power plants for buildings and facilities. It can also serve as the outer layer of the structure while simultaneously generating electricity for on-site use. Through our innovations, we found ways to utilize solar panels into serving more than just its original function. Solenergy's team of outstanding architects and engineers can design and construct solar-powered systems that utilizes panels to serve as roofs, skylights, or even building facades! This opens plenty of possibilities in terms of arrangement and construction. Truly, Solenergy's creativity and innovations are unparalleled in the industry. Utility companies who are looking to add solar power to their resources must first understand the market, its significant drivers, as well their implications in order to achieve valuable and cost-competitive solutions when it comes to building and sustaining large scale projects. Knowing this, Solenergy can provide complete analyses and feasibility studies that encompass all necessary topics such as the market, technical, managerial, social, environmental, and financial aspects of extensive solar plants and farms. We pride ourselves in our extensive experience and knowledge in the field of solar photovoltaics. It allows us to work with various types of companies that can range from the energy industry to even construction management; many times over we have offered our expertise on utility scale solar support in numerous projects. Our services are not strictly one note. Here at Solenergy we ensure that projects are seen through from beginning to end, and that includes the development phase especially. We will be there whenever needed and will guide our clients through the process entirely, offering our expertise and knowledge at every turn. Through our extensive knowledge in photovoltaics, we can ensure that every project we work on is sure to yield only the best results, especially when it comes to electrical output. Our use of only cutting edge photovoltaic technologies combined with its financially fair prices secures our clients’ positive user experience. Solenergy’s main purpose is to provide cutting edge custom photovoltaic systems to commercial power users. Each project is treated with individual care and is made sure to fit all of the client’s needs. This holds true especially for those who are in the utility or commercial industries who are looking to integrate solar power into their resource pool. With a core group of highly experienced individuals possessing graduate degrees in Architecture, Engineering and Business Administration, Solenergy aims to work with businesses that are fully committed to sourcing power that’s not only clean and efficient, but most importantly reliable. Solenergy has been providing businesses all over the country with high quality solar-powered systems for several years. We have made it our mission to create energy solutions that would benefit millions of Filipinos, as well as the environment. Truly, Solenergy has always upheld its commitment to cater affordable, yet superior services to every client. Solenergy is a progressive company that aims to continuously innovate available resources in order to create superior solar-powered systems. We believe that our clients should not settle for less and so, we constantly endeavor to innovate our products and services to ensure that we deliver only the best. This attitude is what made Solenergy one of the top businesses in the industry. Solenergy is famous for the excellent work ethic exemplified by its employees. From start to finish, we provide our clients with high quality service which made Solenergy one of the most reputable companies in the industry. 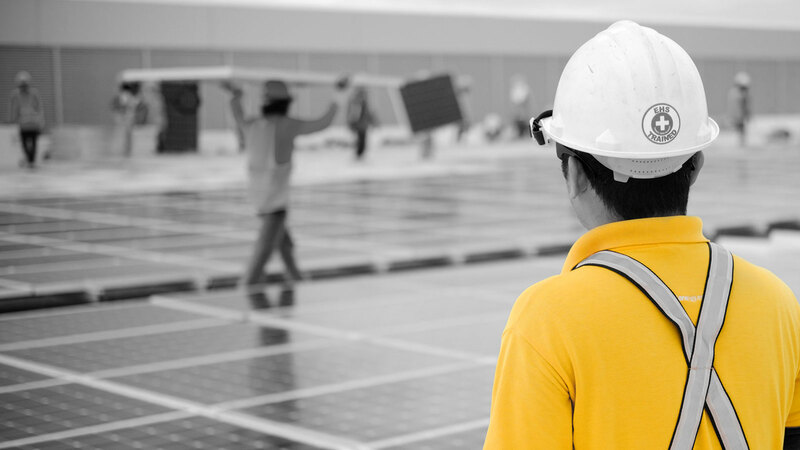 Here at Solenergy, we make sure to provide Filipinos with superior solar-powered systems that met the standard requirements to ensure the safety and productivity of our products. Through the years, Solenergy proved to be a dynamic company. We welcomed every change in the industry with a resilient attitude that allowed us to easily adapt with every new breakthrough. In result, we are able to continuously provide clients with high quality solar-powered systems since Solenergy's establishment. Solenergy is among the first companies in the Philippines to show interest and desire in providing Filipinos with a more affordable and sustainable power alternative. As years went by, we resiliently continued our endeavor to supply businesses from various industries with dependable solar-powered systems. Now, Solenergy is considered as one of the pioneers, as well as one of the leading companies, in the industry. © 2019 Solenergy Systems Inc.. All Rights Reserved.